Filter Cleaning, Aeration, Herons and Brushes need thinking about. It is during the summer months that the biological loading on your filtration system is at its peak. Not only does it have the highest concentration of ammonia to purify but particles of fish waste and dying plants (including algae) will be entering your filters. It is important to flush the filters to remove as much waste as you can on a regular basis during the summer. This will keep the filter clear so that water can pass through the biological section of the filter efficiently thereby maximizing the biological activity. Secondly, the sooner you remove rotting waste from the system, the less harm it can do to your water quality. There is no magic temperature at which you should add supplementary aeration to your pond because it depends upon the design of your pond and how many fish are in it. As a rule of thumb, we would recommend it at any water temperature above 16 degrees C. Supplementary aeration will prevent stress or deaths caused by low oxygen levels but it will also improve the efficiency of your filter. Biological filters use significant amounts of oxygen to do their work and low levels will severely reduce performance. There are many great value air pumps on the market today and they are cheap to run. If it is possible for you to connect your air pump to a separate electrical trip to your circulation pump, this gives extra security. We have seen it many times that a faulty water pump has blown the trip and stopped the air pump too. In this scenario, by the time the owner finds out it may be too late to save the fish. 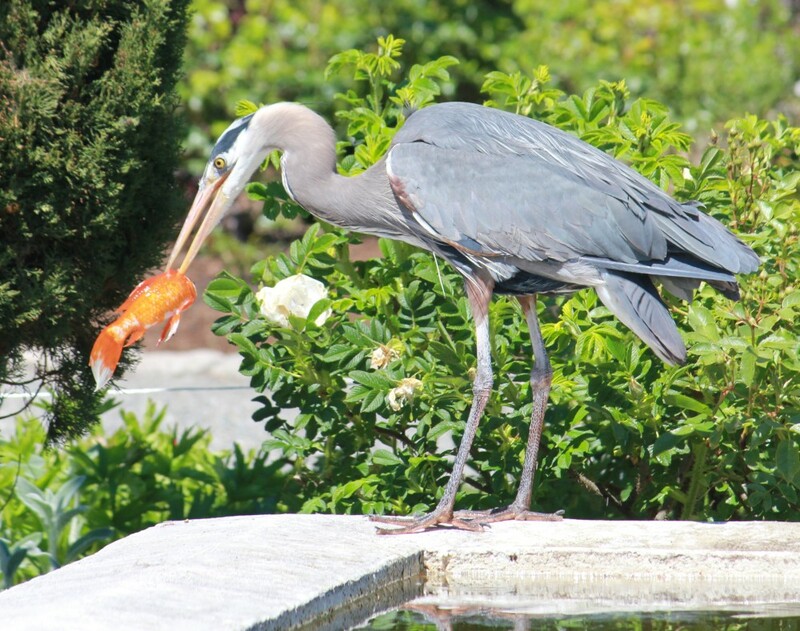 Herons can pose a serious threat to your fish. Generally though, if a heron cannot get its feet in your water then it cannot get your fish. If the water is more than about 250mm deep, a heron cannot land in the water. Usually they land beside the pond and then try to wade in. If there is somewhere that they can do this, either protect that area with some netting, a few strands of mono filament fishing line or string. Your Black Knight brushes will be working hard for you at this time. The best way to clean them is to drain the water where they are and then to jet them with pond water until they are clean. Pond water is better than tap water because it is not chlorinated and it will therefore have less impact on the biological colony that lives on your brushes. If you prefer to use tap water, this is OK but give them just a quick clean. Frequent quick cleaning is far better than a thorough clean with your pressure washer every 6 weeks, for instance.